100% virgin new wool. Hand wash up to 30 °C or dry clean. 150 x 210 cm (including the 9 cm long fringes). Weight 1,400 g.
Merino wool. From the countryside of Rosenheim. Among the local sheep breeds, Merino sheep have the softest wool (fiber fineness 23–28 microns). Since 1947, Höfer, the sheep wool spinning mill near Rosenheim, has specialized in processing precisely the domestic virgin wool that comes from the sheep farms of the area – the largest has a herd of 600 Merino sheep. The sheep are shorn twice a year, the spinning mill sorts the wool by color, washes and spins it, and then weaves it into these blankets. Höfer does not use any chemicals. The color comes from its natural state. Merino wool comes in several natural colors from white through gray to brown. 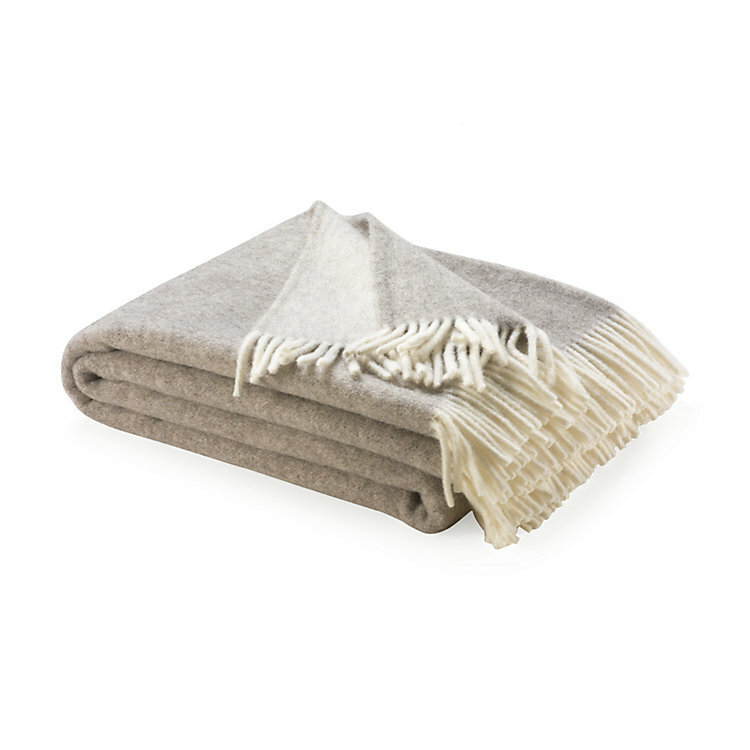 These shades can be seen in these two blankets, since only natural, undyed and unbleached virgin wool is used. Similar to a double face, they have different colors on the top and the bottom; this is because different colors are used respectively for weaving in the warp and in the weft.